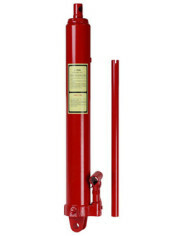 The AutoTwirler ELITE is our original height adjustable rotisserie model. There are literally thousands of these models in the market as it has been the most popular rotisserie for many years. 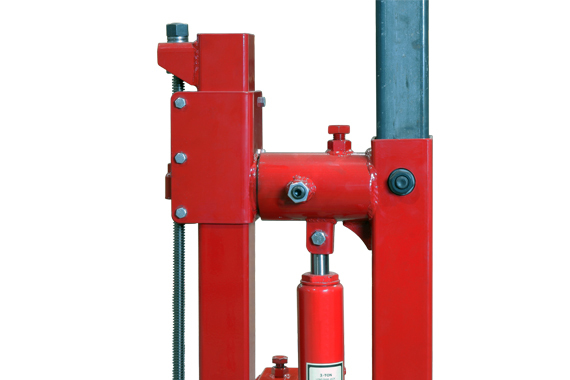 The hydraulic jacks will allow you to pick the car body or frame up from 20” off the ground. 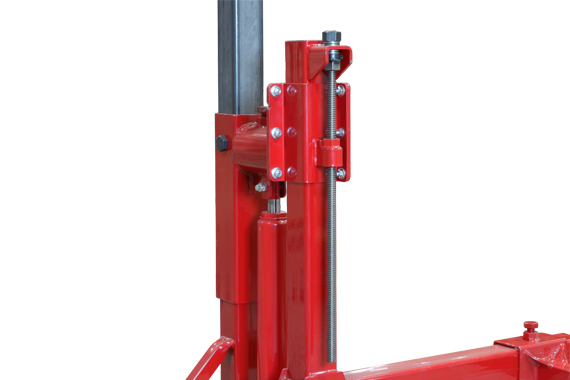 The base is fully welded together for strength and long term durability. The balancer is done with a 3/4“ Acme rod with a real wide thread, made for lifting, used as a screw jack. Please note that Acme thread is a wide thread which is formed and not cut; it is made for lifting, unlike all-thread. The weight is secured by L & W brackets Note, we use A325 structural grade bolts, on all of our equipment to prevent stripping out or damage. contractor to build their equipment. It is used by the Big 3 auto companies in their quality control and training areas. It is used by West Coast Customs, Chip Foose, Bryan Fuller, Ring Brothers, Detroit Speed, and many other restorers. It was X-rayed and verified by a government engineering contractor in Texas who then sold it as part of their project to NASA. The design of this unit was confirmed by this company in 2009 and it passed as it was. Since then, we have made the swing arm thicker, the gussets on the swing arm wider, changed the retaining bolt in the pivot to a ball bearing retainer, and changed the caster supplier. So, if you want to know the truth about our equipment, please ask us or investigate for yourself. Overall, this is a great rotisserie. pick the car body or frame up from 20” off the ground. This model has often attempted to be copied by off-shore competitors, commonly painted black, bolted together and packed in a crate, but they are NOT the same quality or performance and they are NOT authorized by AutoTwirler. We do not build products outside of the US. Look for a genuine AutoTwirler, made in the USA to get the quality you deserve. The Elite replaced the Plus model (originally designed in 2000) in April 2015. 3,000 lbs. capacity. Height adjustable model made of 3” square tubing. The horizontal member of the swing arm is 3/16” thick. 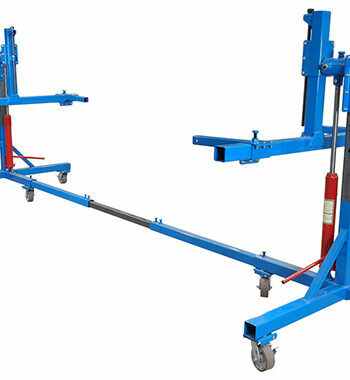 20" Minimum Mounting Height, 14" with casters removed from the AutoTwirler ELITE. 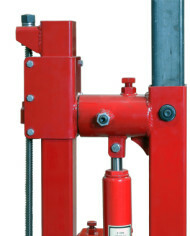 4 – 16" Mounting Arms. 3 piece telescoping center bar allowing 19' of extension. • Six (6) – 5" Heavy duty poly on cast iron at 880 lbs. each, includes 4 caster locks. Optional 8” caster upgrade. 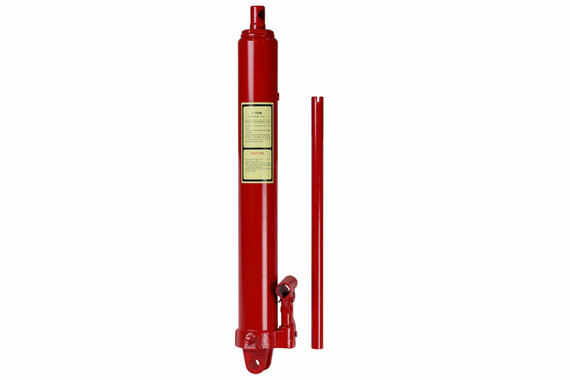 Two (2) – 3 ton, long ram hydraulic jacks for working height adjustment. 20” stroke. 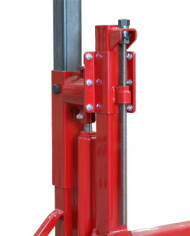 Optional 5 ton jack upgrade. 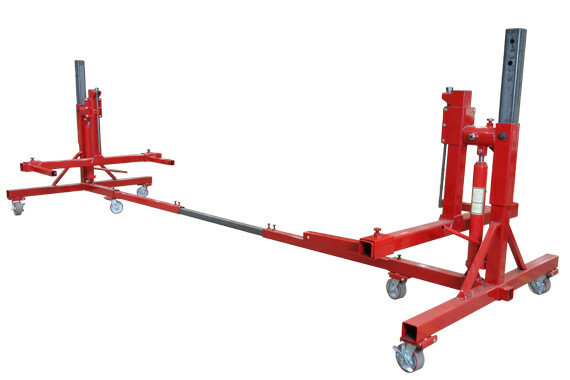 72" x 30" x 58"
The AutoTwirler ELITE is manufactured in Utah and comes with our 1 year caster & jack / 1 year steel warranty. Unless otherwise noted, the AutoTwirler ELITE ships bare steel. Powder Coating is available in red or blue for additional cost.